I use these guys for some of my clients; absolutely rock solid and blazingly fast - check them out! In LUbuntu (and Ubuntu and XUbuntu) there are a number of fairly decent VNC servers, broadly split into 2 groups – 1 lot that let you view the existing desktop (i.e. remote control your existing session) and the other lot that create seperate X sessions that only exist under the VNC server. I’m interested in the first lot, and I’d like to be able to login to my X session over VNC before I’ve logged in on the box itself. A standard package in Ubuntu is the Vino VNC server – it’s the one that’s used when you select “allow users to remotely control my pc” which is quite handy. 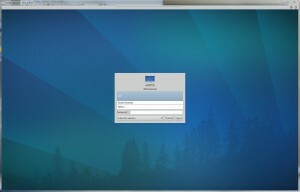 However, it only lets you log in once your user has logged into Gnome or XFCE (i.e. after you’ve got past the login promt in GDM or LightDM) – so if your PC reboots whilst you’re away, it’s a bit of a pain as you can’t VNC into it. In XUbuntu 11.10, the team removed GDM (Gnome Display Manager) and replaced it with LightDM (Light Display Manager) so these instructions are specific to that, although they may work on other setups. These instructions also carry over to Ubuntu/LUbuntu (lxde-based) 12.04, and probably 12.10 too as they now all use the same login display manager. LightDM apparently supports a VNC server out of the box; however, it’s designed to work with tightvncserver (or similar) which create separate X sessions (the 2nd lot of VNC servers I mentioned above) so not quite what we’re after1. Ubuntu derivatives use Upstart (upstart.ubuntu.com) to manage startup processes – LightDM (and GDM!) creates a login-session-start event when the display manager is up (i.e. when X is all loaded, but before you’ve logged in) so we’ll create an upstart job that listens for that, and starts a VNC server on the existing X session, allowing connections before login. Step 1 – we want the VNC server to have a password, just in case – the VNC port shouldn’t really be exposed to the outside world – it’s easy to wrap it in an SSH connection to encrypt everything for you (see here for a good explanation of how to set that up). This will prompt you for a password to (lightly) secure your VNC server. This specifies that we’re going to use a different xauth path; we also need to update the /etc/lxdm/LoginReady file with our x11 command, using the updated xauth path. Reboot! That’s all there is to it – hopefully, you’ll now have a shared VNC server which connects to your main desktop X session, running on port 5900 using the password you gave, all started automatically as soon as LightDM asks you to login. Hooray! The default screen-locker in recent Ubuntu versions is light-locker; this is usually activated when your screensaver kicks in or your desktop is locked. For some reason, this has a bizarre behaviour that replaces the DISPLAY your desktop is running on, and this causes x11vnc to then fail to interact with your active session. Then reboot, and no more ridiculous disconnections. in your /etc/lightdm/lightdm.conf then reboot – should have a separate X session available for VNC’ing into. Thank you very much. That’s perfect. Thanks for this, worked for me on Xubuntu 12.04 and stayed working after in-place upgrade to 12.10. I did notice that it seems to disable X auto-repeat while a VNC client is connected, even on the local side. Adding -repeat to the x11vnc line of the script(s) seems to fix it, or you can run ‘xset r on’ in a terminal to enable it on a case-by-case basis. I’m not yet seeing ill effects from omitting -noxrecord -noxfixes -noxdamage and enabling -repeat with TightVNC 2.6 as the client. Cool, glad it still works on Xubuntu with their display manager. According to the Ubuntu x11vnc man pages (http://manpages.ubuntu.com/manpages/lucid/man1/x11vnc.1.html), versions shipped with 10.04 LTS and newer will wait until a window manager is running before using XFIXES in order to prevent the crash you mention. It therefore seems safe (so far) to omit the option, which is great for me because I prefer to be able to see what the mouse cursor is actually supposed to look like. Since Xubuntu uses xfwm4 instead of compiz by default, it seems safe to omit -noxdamage. Nice find! Ok I’ll give that a go too 🙂 thank you! I have Ubuntu 12.10 running, I have installed x11vnc and I created the /etc/x11.conf file with the script above but how do you get x11vnc to run on startup? When I do a ps -ef | grep x11 it’s not running. I have no problem with connection to vnc4server at 5901 to separate x session (lxdm) but when I try to connect to x11vnc at 5900 I getting a login screen (lightdm) and after typing my password connection is reset (vnc client exits) and I am back to login screen with next connection try. I have removed vnc4server but problem still exist even after restart, so I cant connect anymore to x11vnc. I need both vnc to main and separate x sessions any help please. Thanks for this solution. I spend many hours before I found this. Know it simply works! Thanks for the “how to”. I have spent several days trying to get this to work from lubuntu to both lubuntu and ubuntu 12.04 with limited success. I tried your instructions and it worked the first time. One minor issue – when I used remmina, I got what appeared to be a remote desktop without the bottom panel (only one on default lubuntu). After some minor headscratching, I saw the (almost invisible) vertical scroll bar. The bottom panel was off screen! Used the Scale Desktop option to map screen resolutions and all worked fine. FANTASTIC! Works perfect! Your extra instructions for Mint filled in the gaps. This is absolutely brilliant. Thanks a lot for putting up this guide! I tried this on a MK802 II running Miniand’s Lubuntu 12.04 and it works like a charm. Did anyone else try to print the webpage and end up with a giant raptor overlay? That should give you a proper raptor! Hi Joe, I haven’t tried getting it on another display – although perhaps changing the :0 in the auth file to :1 might work? Sorry I can’t be of more help! This works great on Asus Transformer TF300T tablet and Xubuntu 12.10. Thank you for the easy steps to set this up. This worked great for me (Ubuntu 12.04, using step 2a for the xubuntu/xfcs desktop environment). After the setup, I had to do one more thing that was not documented here: while in the SSH session where I set all of this up, I ran “initcfg start x11vnc” to start VNC for the first time; now, it appears to reliably survive both reboots and logoffs. Thanks! This is working very nicely on 12.10. Your explanation is great. Ask the password but close inmediately. Do you know how it can work well with ubuntu 13.04?. I’ve been following my instructions from above on Ubuntu 13.04 and it works fine; which part asks for the password? The problem may be for the vnc client. But if I use another vnc-client, for example vinagre, i can connect ok. So the problem is in remmina as vnc-client to connect with Ubuntu 13.04. Recent Lubuntu distros have LightDM too. So the step 2a worked great for me under Lubuntu 13.10. Very good tutorial! This works like a charm:). Thank you. Step 2c is only required if you couldn’t do 2a or 2b – which variant of ubuntu are you using? I am running Ubuntu 14.04. I followed all of the steps in this guide, but when I connect it seems like it is in View-Only mode. I am using RealVNC on a Windows 8.1 machine. I have the options selected to allow keyboard and mouse input, but no luck. I can only view the screen. I can’t interact with any windows or type text. Any thoughts? Never mind. I rebooted again and this time it started working. If you remove the -bg parameter, upstart will track the x11vnc process for you. This allows you to (re)start/stop the x11vnc server via initctl commands (e.g. sudo initctl start/restart/stop x11vnc). It may also be worth putting the respawn keyword after the “start on” line if you’re at all paranoid about x11vnc crashing, as this will direct upstart to relaunch it when it dies. Forgot to mention that the “-wmdt xfce” line is only for Xubuntu/Xfce. This worked great for Ubuntu 14.04LTS!! Thank you! Thanks for this — worked first time and is exactly what I needed for a VNC connection to my desktop at home, from my android running pocketcloud. For Lubunut 10.04 I tried to edit the file /etc/lightdm/lightdm.conf in this way and work. Brilliant! Great to hear you got it working even on a very old release! For Lubuntu 14.04 LTS + LightDM, sometimes this does not work due to the default screen may switch from :0 to :1 or :2 etc and during screen saver / screen lock and for some reason unable to release it. That is certainly one way to handle it. The issue is actually caused by light-locker which is what the default Ubuntu screensaver uses to lock your screen, and it’s this that does the bizarre DISPLAY replacement. However, I’m more than happy using xscreensaver or i3lock, and they don’t replace the active DISPLAY which means x11vnc continues to work. Wow, it works even on Lubuntu 14.04.1 / PPC (I had no success with other methods). I just needed steps 1, 2a and 3, without any extra quirks. Question: What is the correct way to switch users with this method? I noticed that by selecting the setting icon in the top right hand corner of the screen and then selecting one of my other desktop users that i lose connection. It works!!! I use Lubuntu I could get a x11vnc server working but I had to use autologin…. I upgraded from Lubuntu 11.10 to 14.10 …. my vnc server would just stop after 5 minutes and not do anything…. This just works. I’m trying Lubuntu 15.04 who use SystemD by default instead upstart. Since 2 day, I’m triyng to get the same behaveiour than you with upstart (with Lubuntu 14.10 (upstart), I haven’t any problem). Thanks a lot for this howto! I’m trying to set up kodi at home, and it helps me a lot. The introduction about the 2 groups of VNC server and the instructions for all the different display manager are very usefull. Thanks again. Just trying this with Lubuntu 14.04. Seems the path to /etc/lxdm/lxdm.conf has changed. For Lubuntu 14.04 that “file” is a symbolic link to /etc/alternatives/lxdm.conf so I edited the original file instead. I undid the steps in my last comment and followed step 2a instead, it seems my Lubuntu 14.04 uses lightdm (by default as far as I know), so step 2a in your post worked. Maybe add a cautionary note before step 2a to verify which dm is active before attempting 2a,b,c? By looking in /var/log for a file directory named gdm, lightdm, or *dm? OMG I have been struggling with vnc issues and xubuntu 14.04 for over a year. Steps 1 and 2a fixed it! I spent so much time googling for answers and never suspected it was a ldm issue. I support 15 xubuntus at our local library and need to get in fast to any machine to give remote help and support. I am still having issues with the ssh tunneling I have to go through a router on the remote end and a forwarded port. I keep getting password failed. I think it is some step required to set a ssh password but can find nothing on that. Thank you so much I hope this stays with updates. *** x11vnc was unable to open the X DISPLAY: “:0”, it cannot continue. *** There may be “Xlib:” error messages above with details about the failure. Which suggests X isnt running when it fires up? Any ideas how i can trouble shoot this. Followed these instructions but I fall at the last hurdle. When I try to connect I get an authentication failure. It is as though I typed the password wrong but I’m definitely using the one I created in the password file. Both commands failed, the former because it was not installed and the latter because it was already installed. I’m now scratching my head and any pointers would be much appreciated. Thanks for these instructions! I’ve used them in the past and everything worked perfectly. I just wanted to point out that this also works with Linux Lite v2.4 using the instructions from step 2a. Just wanted to throw that out there in case any other users are looking for this information.